Fallout 4 is an award-winning game in Bethesda studio’s series of post-apocalyptic themed releases. 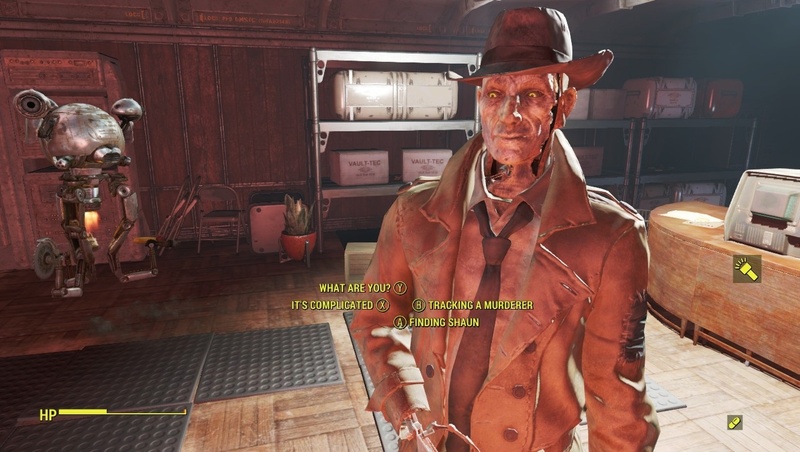 Fallout 4 is uniquely known for its quirks, diverse cast, and history-inspired storytelling. Let’s see if Fallout 4 can top its predecessors while maintaining the core elements of the Fallout series as an all-time favorite RPG. Probably the most interesting thing about the Fallout Franchise is being immersed in the world itself. In the World of Fallout, the culture reflects that of the 1950’s: An alternative retelling of history, resembling a renaissance diverged from the real world timeline, thereby based around the future as it happens in 2070. The game adopts future tech from the 1950s, including robots, power armor, laser guns, and the most important piece, nuclear power. The screenshot I took below is self-explanatory. An effective World War III initiated and all of America was bombed into oblivion, leaving few survivors. Skip ahead a few hundred years, and you reach the point where Fallout take place. The land is now barren, where the ancestors of the survivors roam the land, contending with bands of crazed raiders and these mutated creatures, adapted to the radiation that spread across the land. In Fallout 4, you travel through Boston, MA. One of the cities hit by a nuke, and traverse an accurate recreation of America’s historic city in a state of disrepair and futuristic but ancient creations. Just like all the other games though, the city still lives with pockets of survivors, not to mention the funny or quirky adventures that come from making a home in the place they call ground zero. Every main Fallout game has the protagonist take up the role of a Vault Dweller, an individual who hid away from the world in town-sized bunkers, under the Earth, made by the company Vault-Tec. They typically serve as protection and a testing ground for the inhabitants of the vault. Fallout 4 however, is the first game to have the main character be one of the original members of the Vault which I’ll elaborate on a bit. Vault-Tec sets up each Vault to experiment on the people in the vaults for the sake of science, by sadistic means. The experiment conducted in the main character’s Vault 111 was to attempt to cryogenically freeze its inhabitants and wake them up later. Not knowing this, your character, along with their spouse and infant son are frozen and sent forward into the wastelands of 2287. Before being freed from a pod, your character unfreezes for a brief time and witnesses not only their spouse getting shot but also their son being kidnapped by an unknown group. 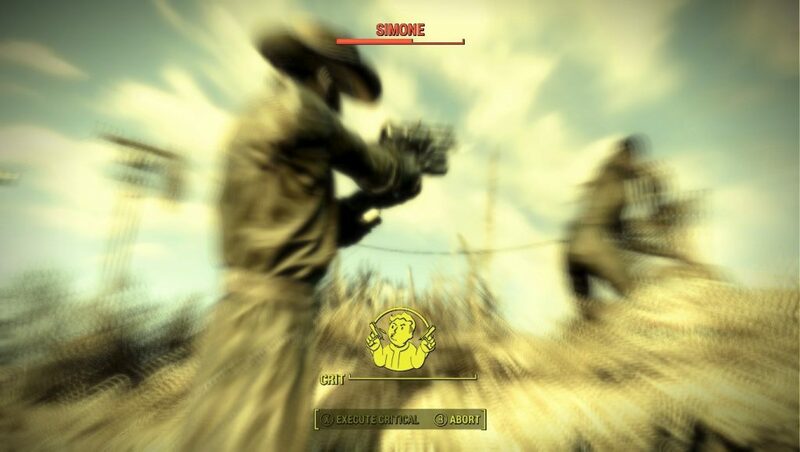 As a parent with a dead wife and lost son, it becomes your goal to brave the wasteland of the Commonwealth to find your son, Shaun. A pistol shot seen in slow motion. Along the way, you can join in on the adventures of multiple factions of other survivors. Your character’s adaptability to this new world trains them to become the ultimate combatant. Ready? Aim…Fire! Much like Bethesda’s Elder Scrolls Series, Fallout 4 is a first-person RPG shooter. The game does provide many different quests and options for all kinds of hilarious shenanigans. Want to see Fallout 4’s unique weapons and armor mods? Just like the previous games, you still have access to a unique feature that makes the game feel more RPG than FPS, called V.A.T.S. (Vault-Tec Assisted Targeting System). 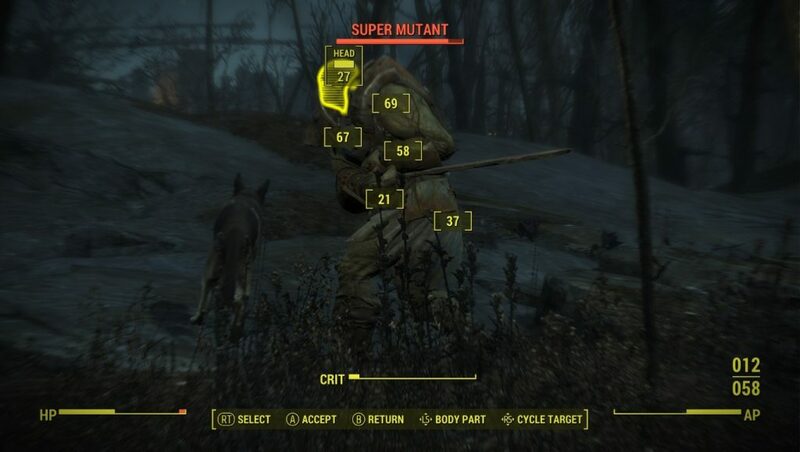 With VATS, you may slow time to a crawl so you can pick and target your attacks from a percentage chance to hit on the targeted enemy. You’ll see a cutscene play out with your bullets in slow motion either hitting or missing your target. VATS goes a long way towards making Fallout games playable by people who aren’t confident in their FPS reflexes, simultaneously still leaving the door open to let twitch shooting players avoid this system altogether. While VATS appeals to a broader audience, there are two ways you can perceive Fallout; like a First-Person Shooter or by viewing your character’s Pip-Boy, (standard issue for all Vault Dwellers plus Vault-Tec’s Iconic mascot), as Vault Boy. The Pip-boy is basically an arm mounted smartphone that you can use to organize, monitor, and affect your faculties. It lets you use Items, level-up, tune into radio frequencies, track locations, Heal, and other cool gadgets. The Pip-boy acts as a stylistic menu system for the player, and with a downloadable app, you can even use your real life Phone as your Pip-Boy which won’t affect the PC gamers at all. 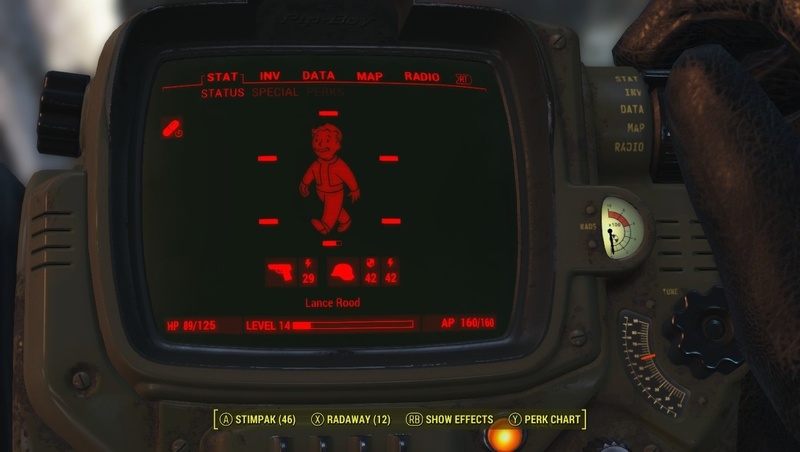 The big new thing in Fallout 4’s gameplay is the settlement and crafting system. Shortly after leaving the vault the player will discover certain locations with workbenches that can be used to alter your gear through various upgrades. By finding pieces of junk throughout the wasteland such as an older camera, some super glue, or a little toy car, you can break down the pieces to reassemble them on your weapons, armor, and other things to improve your survival. 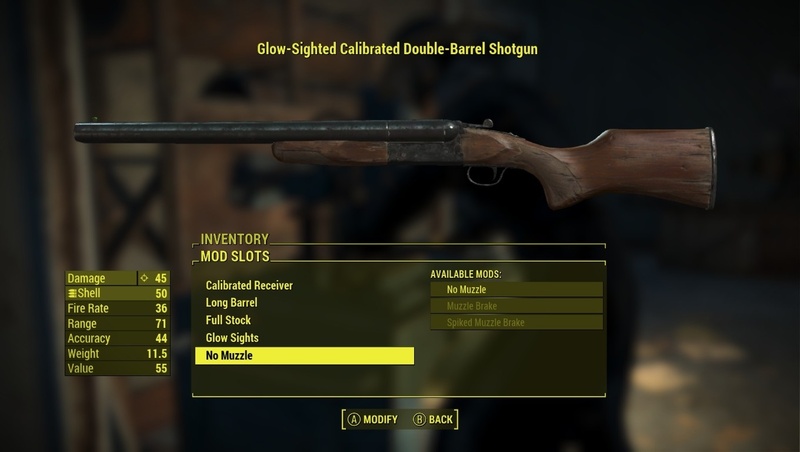 An example of modding your shotgun on the workbench. These workbenches are fairly common, often divided into many categories. The most important one can be used in sectioned off areas where you can set up a homestead and make furniture, living quarters, and resources to help your settlers survive. You can attract people to these locations, establishing a bunch of small communities that you are in charge of, making Fallout 4 a very interesting extension into community management as well as atypical traveling and adventuring. Each character out of the Vault is able to custom sculpt their face and set up their SPECIAL system, which operates as your Ability scores in Fallout, standing for Strength, Perception, Endurance, Charisma, Intelligence, Agility, and Luck. By distributing these skills accordingly, you are given a vast number of options to build any sort of character you want. Whether you want to be a Warrior, Gunslinger, Scientist, Charmer, Soldier, Leader, or even a Bare-knuckle Brawler, each choice is equally viable and possible, compared to the others. By leveling up, picking certain perks, and distributing your SPECIAL skills correctly, your character can practically become almost anything you want them to be! Thanks to the Crafting system, the outfits you wear are possible to upgrade and lets you have a loadout you that fits your preferences. Fallout, to the uninitiated, may sound like a bleak, sad series. However, in my opinion, that couldn’t be more wrong. Despite the depressing setting, many characters and oddities in the game shine extremely brightly. Fallout has had time to grow as a series, which is why the fourth game managed to continue the world extremely well. Music in the Fallout world has always been right on point, with a 50’s style that is fun and upbeat, making walking alone the wastelands like a badass (like a boss!) one heck of an enjoyable experience. Lastly, I want to discuss the companions you meet. While Skyrim has dozens more to choose from than Fallout 4, I only found two or three of them to be interesting. On the other hand, each and every one of the companions you meet in Fallout is carefully developed and come with their own original stories. I could happily work with any one of them because they feel more like people than a collection of ones and zeroes that act as your pack mule/group fighters. 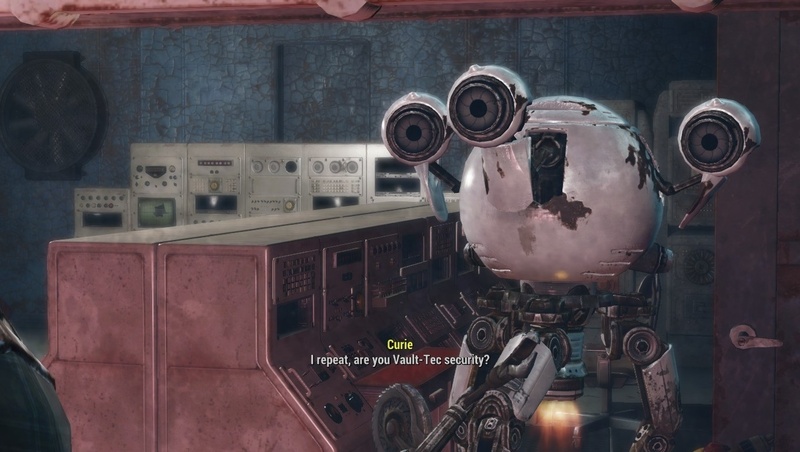 In the previous Fallout games, your character never spoke, you simply picked from a list of options and picked dialog that best suited your thoughts, it wasn’t said out loud, but it had variety and choice, two very vital things in an RPG. In Fallout 4, you are limited to at most 4 different answers, and many of them have the same meaning as the other speak decisions. I would end up mashing the button to skip through dialogue faster, not really caring about the outcome. I understand that with the characters being voiced, they inevitably enforce more restrictions on dialog, but that doesn’t really help. I feel like I am following the story of the Vault Dweller, and while that is a good story, it’s not the same as the feeling of making my own story. 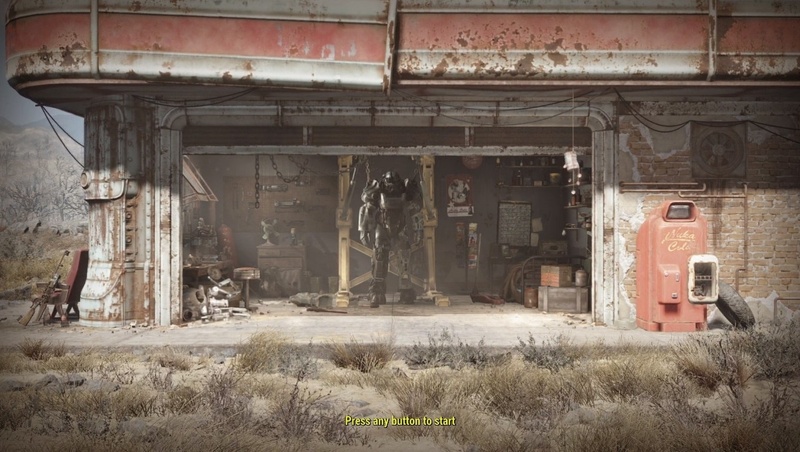 Last but not least, Fallout 4 runs on a whole new engine than the previous games. Many things that old fallout fans would be excited about aren’t there and have been reworked. It is all very different, it still feels like Fallout no doubt, it’s just well, something that takes some time getting used to. New elements along with the old kept the game innovative. I did enjoy the blend of 50’s themes as they complement the setting and tone quite well. The graphics were nothing to complain about though it isn’t anything spectacular either. I think Fallout 4 is a great game to play around in despite some flaws with the new system. Fantastic Review of a great game! I agree that the graphics are not that great, but I feel that has actually become a staple of this series. They always seem to focus more on building out the size of the world at the expense of the quality of the models. What do you think about the leveling system in this game versus the previous installments in the series? Personally, I prefer the former level system since it let you be far more specific with what you wanted to invest in. I will say that the Fallout 4 level system gives you far more options to decide to improve on, but that was also a weakness. There were way too many options and I never felt like I could focus on them all, and on top of that I felt limited by them putting level caps on achieving the next rank in skills. I preferred the Fallout 3 and New Vegas skills and Perks separation rather than doubling down on more Perks that you can’t access until you become high enough level.